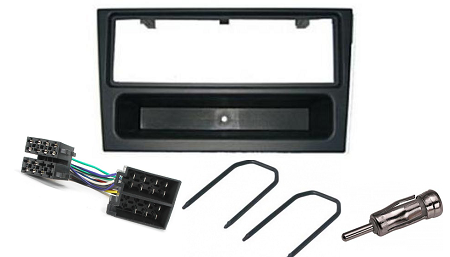 Vauxhall Stereo Fitting Kit, allows the fitment of a Single DIN aftermarket headunit to the selected vehicle. 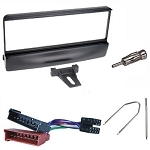 This kit includes Fascia Surround Panel, Wiring loom, Stereo Removal Keys and Aerial connections. FASCIA ADAPTOR: This adaptor will convert the non din-sized aperture left after removing the factory stereo to a single din size ready for head unit installation. The high quality finish, colour and texture are designed specifically to maintain the original look of your vehicles interior. WIRING HARNESS: The wiring harness will allow to install the stereo without having to cut any wires. AERIAL ADAPTORS: An Aerial Adaptor is needed when replacing the original factory fitted head unit with an aftermarket head unit. STEREO REMOVAL KEYS: Stereo Removal Keys to remove headunit from the fascia cage. Many OEM manufacturers are incorporating special locking mechanisms into their head units in an attempt to prevent stereo theft. This means that to remove one of these units you will require a manufacturer specific stereo removal key to prevent damage to the head unit or the surrounding fascia and cage.